Monogram Santa Fe bucket tote bag. Solid natural cotton twill in a dark teal with a off white fleck throughout. Large and roomy opening, with wide 12" bottom. Faux leather handles attached with brads. Nice city tote for the days necessities. This classic cotton tote could be a standard out the door tote. Carry it for market day shopping, back and forth to work, library or craft classes. Personalize it with a monogram. 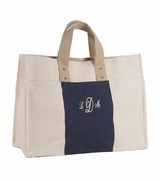 Monogram cotton bucket tote bag measures 20" wide x 15" height and twelve inches across bottom. Unlined.